The article mentions Nvidia favouring this development. Fair enough, but why? What does Power give them that ARM or Intel doesn't? Or is another CPU choice just more leverage to use against the others if they're not flexible enough for Nvidia? That article is bad btw, as it confuses Power Architecture, which is an instruction set architecture (ISA), with IBM POWER, which is one of many microarchitectures implementing said ISA. OpenPOWER is specifically about IBM POWER, not about any other of IBM's Power Architecture implementations or even Power Architecture in general. I think IBM is trying to get volumes up to fight off Intel. They been introducing lower priced gear already and by letting other people in they can grow the ecosystem and get prices down further without hurting their own margins. It'll be very interesting to see what Tyan bring out. You might finally see a sensibly priced POWER system. Looks like they're finally talking about POWER8. Absolute best of a chip. 12 cores, 8 threads each. > Looks like they're finally talking about POWER8. Absolute best of a chip. > 12 cores, 8 threads each. Nice. Does POWER8 feature VSX or has this just been a short episode starting and ending with POWER7? Besides, I'm not sure what to think of IBM's idea to go backwards in time and turn the memory controller into a separate chip again. Anyway, first POWER8-based systems are supposed to ship mid-2014, and IBM "has been designing the Power9 processor for quite a while already". I think Tyan wil be making POWER server boards rather than PowerPC workstation boards. I hope I'm wrong though and they release some nice boards that sell in large numbers potentially providing MorphOS with new boards to run on. I'm guessing that's to do with capacity and keeping the (gigantic!) chip size down. You can hook up 1TB to this thing. In a 32 socket system that'll be 32TB. As for VSX, I've heard it might have "VSX2". Any modern chip takes years to design and these are some of the most sophisticated that exist. They're probably also tested very extensively. >> memory controller into a separate chip again. > I'm guessing that's to do with capacity and keeping the (gigantic!) chip size down. > I've heard it might have "VSX2". Never heard of VSX2 (and in the slides they only mention the VSU with FPU and VMX), but yes, this link indicates that VSX is indeed there (most probably as part of the VSU like in POWER7). "Altera announced its full support of the OpenPOWER Consortium, an open development alliance that makes the IBM POWER microprocessor available under license to other companies for open collaboration and development. Altera intends to join the Consortium formally as soon as the governing documentation process is complete and membership opens." Altera is a very capable company. I have been looking at their FPGA and CLPD products for the last couple months for use as glue logic. They also have an agreement with Intel to begin fabbing processors that combine ARM processors with FPGA components. They should be worth following. Also, I don't believe the PPC or IBM's Power line is "too late for IBM to push". The PPC just had a great run in the last generation of game consoles, and Power 8 looks pretty impressive. > I don't believe the PPC or IBM's Power line is not "too late for ibm to push". My typing favors speed over readability. ""This is our first OpenPOWER partner that is doing full-blown microprocessor development from scratch," Brad McCredie, vice president and IBM Fellow for the IBM Systems & Technology Group, told POWER IT Pro. "They are taking our POWER8 technology, customizing it for the Chinese market, optimizing it, and they will be delivering it. It's exciting because we've now really started to expand our microprocessor ecosystem," he explained. [...] Suzhou will be actually building customized versions of the POWER8 chip itself, using either IBM's chip fabrication facility (fab), or by tooling up their own fabs to manufacture modified POWER8 chips directly." "The startup, called Suzhou PowerCore, is a sister company to an existing Power chip licensee called China Core, or C*Core for short. The companies share the same CEO, Jiang Zheng, but they will operate separately. Suzhou PowerCore has joined IBM's OpenPower Consortium and is the first licensee of the intellectual property behind the Power8 processors [...]. The goal [...] is for Suzhou PowerCore to put together a chip development team and make customizations of the Power8 design that make it more suitable for servers and storage in the Chinese market. 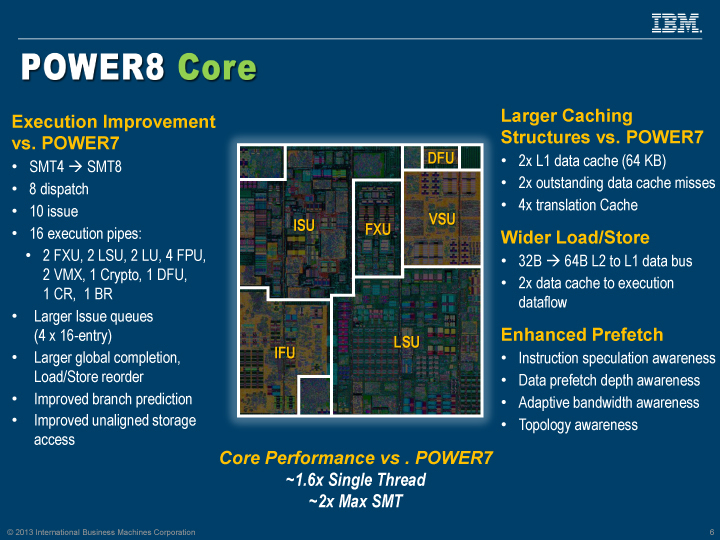 [...] At first, says McCredie, Suzhou PowerCore will make modest tweaks to the Power8 chips and use IBM's foundry in East Fishkill, New York to make its variants of the Power8 chip. Over the longer term, Suzhou PowerCore will make more substantial tweaks and will also have the ability to have its variants run through other foundries." "Brad McCredie, vice president of Power Systems development within IBM’s Systems and Technology Group, tells EnterpriseTech that the arrangement with the OpenPower Consortium gives Suzhou PowerCore a license to the forthcoming Power8 processor, and will allow the startup to tweak the design as it sees fit for its customers as well as get the chips made in other foundries as it sees fit. Initially, Suzhou PowerCore will make modest changes to the Power8 chip and will use IBM’s chip plant in East Fishkill, New York to manufacture its own variants of the chips. The timeline for such modifications is unclear, but McCredie said that, generally speaking, it can take two years or more to design a chip and get them coming off the production line. Presumably it will not take that long for Suzhou PowerCore to get its first iteration of Power8 out the door, particularly given that IBM will have worked the kinks out of its 22 nanometer processes as it rolls out its own Power8 chips sometime around the middle of the year. The chip development teams of Suzhou PowerCore and IBM are working on the timelines and roadmaps for the Chinese Power chip right now. [...] The initial target markets for these PowerCore processors are in banking, communications, retail, and transportation – markets where IBM has made good money selling its own Power Systems machines for the past several years. Suzhou PowerCore expects to see its Power variants in server, storage, and networking gear eventually. Suzhou PowerCore is putting together the first chip development team that is working in conjunction with the OpenPower Consortium. [...] The Research Institute of Jiangsu Industrial Technology is given the task of building an ecosystem dedicated to Power software and hardware across China. Incidentally, Suzhou PowerCore is a sister company to China Core Technology, or C*Core for short, which is a licensee of the Freescale Semiconductor M-Core and IBM PowerPC instruction sets. C*Core licensed the PowerPC instruction set from IBM in 2010, and its C8000 and C9000 chips are aimed at the same embedded markets as the ARM Cortex-A8 and Cortex-A9 designs." "Mr. Zheng Jiang is the Chairman of the Board of Suzhou PowerCore Technology Co., Ltd.. He also serves as Chairman of the Board for C*Core Technology Co., Ltd."
Well, I for one am not comfortable with that development. What could be the benefit to IBM in allowing to Chinese to move into their market? Especially if fabbing can be carried out at other facilities? Should the Chinese continue to develop serious footholds in any other IT market, I will have to stop supporting those as well. Its time to stop surrendering all our markets to this country. For the most part, their products are second rate, and the treatment of their citizens is appalling. Jim, I suggest you strenuously avoid finding out where your clothes, furniture, tools, consumer electronics, car and / or car parts come from. And how you can afford your current quality of life. I also suggest that you don't look too closely to compare how people are treated in your own part of the world. Since most of us in the US earn more than $1 a day and don't have to worry about tanks running over us during a political protest, I feel pretty comfortable. Frankly, if you want to join this march toward unifying the globe on the low labor relations status of the Chinese, be my guest. I for one will avoid their products when I can. And this certainly includes ICs produced by them. What does all this mean to the average MorphOS end user? If there a possibility, however remote, that new PPC processors and boards come to market some years in the future? IBM will continue supporting Linux PPC. Until transition to ARM/x86 is done, this is good news for MOS camp, we "just need"
> What does all this mean to the average MorphOS end user? > to market some years in the future? New PPC processors and boards are coming to market all the time, just (almost) no boards suited for desktop computing. And yes, there is the (very remote) possibility that an OpenPOWER Foundation member takes an IBM POWER processor, scales it down to desktop power consumption and price levels and puts it on a board that can be used for desktop computing. POWER7 is not really suited for the ordinary home for several reasons. Oh yeah, Power8 is beginning to look promising. I wonder if there will be affordable processors in the line. I wouldnt count on it since the only thing using them is hight end servers, and very few at that. Yes, but on the flip side, the Chinese are buying into this and they don't usually do high end projects.